Identification: This is a light brown animal faintly reticulated in darker brown and flecked with white. It has four symmetrically placed patches of brick red pigment and its surface is decorated with small, widely spaced white-tipped tubercles. Natural history: Spinoaglaja(?) sp. #3 is known from only one animal found on the inner reef flat at Hekili Point at a depth of about 1 m (3 ft). Distribution: Maui; also known from Indonesia and the Red Sea. 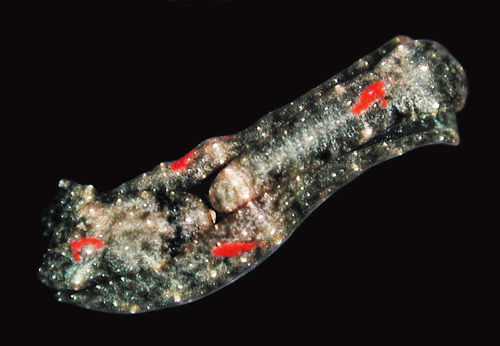 Taxonomic notes: It was first recorded in Hawaii at Hekili Point, Maui by CP on May 15, 1999. Manuel Malaquias suggested that this species is a Spinoaglagia based on external features but it hasn't been confirmed by anatomy or DNA. (pers. com.) Gosliner, et. al. 2018 lists it as a Philinopsis sp..
Photo: PF: 8 mm: found by CP; Hekili Point, Maui; May 15, 1999.